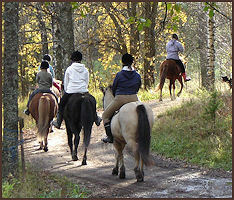 We mainly arrange trail rides, that can range from 1h to long rides up to 2 days. 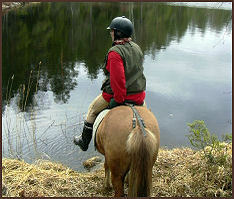 We also arrange riding lesson on the riding ground and arrange courses. All excursions are planned according to the customer's wishes. In the summer we arrange camp activities. The stable has a liability insurance but all riders must have an active accident insurance. In the summer it is possible to arrange accommodations in our four-person log cabins. Lessons should be canceled at least one day in advance by phone. Half day and whole day trips should be canceled at least four days in advance. 2 days trip should be canceled at least ten days in advance.